After a long time, this month the Baking partner's were challenged to bake something savory. Archana of Mad Scientist in Kitchen chose Tomato, Thyme, Sage, Double Cheese Tart from BBC Good Food March 14 issue and Cheddar and Sage Scones from BBC Good Food as the bakes for the month. I being me, of course chose the quicker option and baked a batch of scones. And since combining recipes and tweaking good ones have become second nature, I did that and mulled over the goodness of the combined flavors throughout dinner that night. These were really tasty and know what, they were relatively low on the fat too. Actually, the relatively less butter content in the recipe was one of the first things that caught my attention. While most recipes for scones use half a cup of butter, this one used a little less than one-fourth cup. I believe, besides adding flavors, the creaminess of the goat cheese and the egg in the recipe makes up for the fat. 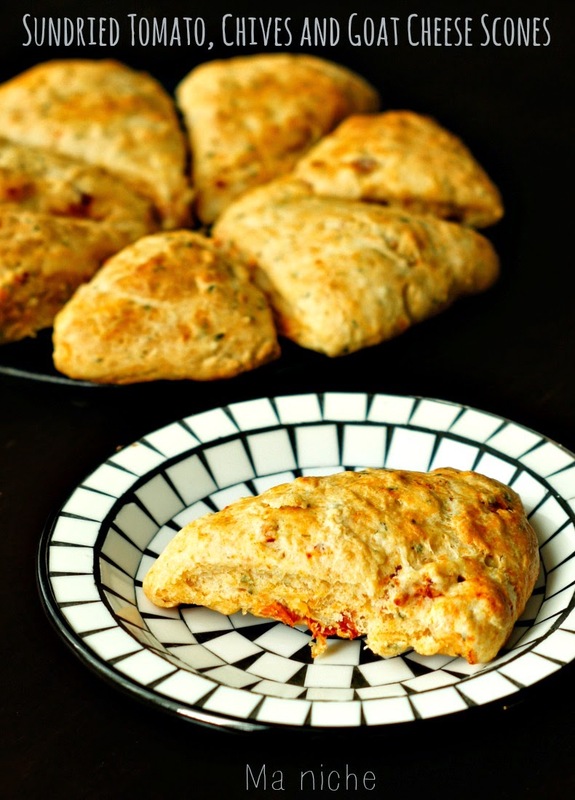 The buttermilk makes these scones soft and cakey and the mustard powder lends a tang which tastes great along with the sun-dried tomato, chives and goat cheese. Center the rack and heat oven to 400 ° F.
Line a baking tray with parchment paper and keep aside. Mix the flours, baking powder, mustard powder and salt in a bowl. Rub in the butter until the mixture feels crumbly. 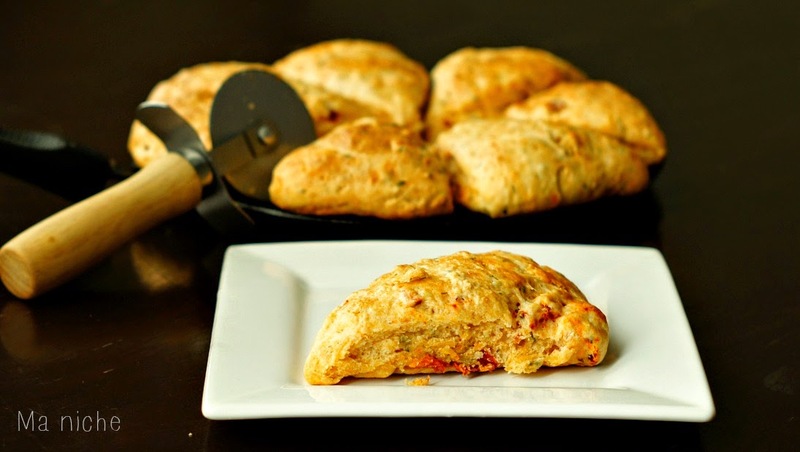 Stir in the goat cheese, sun-dried tomatoes and chives into it. Beat the egg and buttermilk together and pour it over the flour mixture. Mix the ingredients well until soft spongy dough is formed. Put the dough on the prepared baking tray and knead it briefly until it is smooth. Then flatten it to a 9 inch disc. Using a pizza cutter or a sharp knife, cut the disc into quarters, and half each quarter such that you have 8 triangles. Place them apart in the baking tray. Brush each triangle with cold milk and bake in preheated oven for 15 minutes or until the scones are golden and firm to touch. Remove from oven, using a pizza cutter cut them into individual triangles in case they got stuck, cool for 5 minutes, then serve. You can serve them with a simple chicken stew like the Garbure-style chicken stew or Green-as-Spring Chicken stew or even serve them with tea or coffee for a satisfying lunch. Thanks to Swathi and Archana for challenging us, the Baking Partners, with these savory treats ! 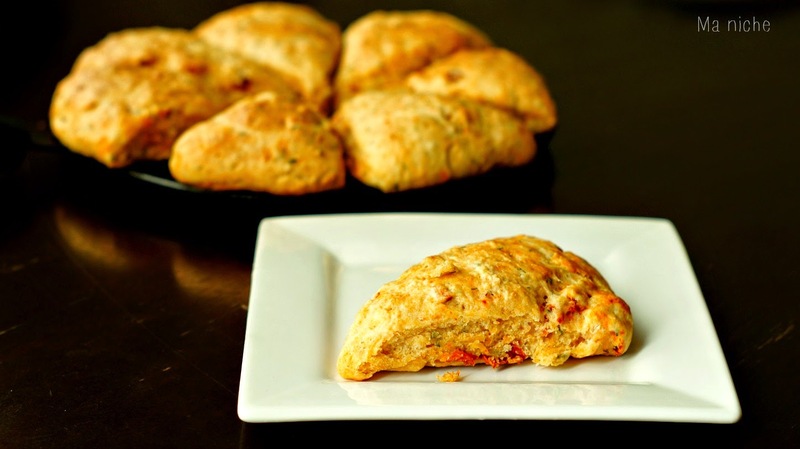 I love the idea of a savory scone! These look wonderful. Wow I like the twist you have given it. Thanks for the mention. Yum! Goat cheese is one of my all time favorite things. So good! If you're interested (since obviously you like to make food! ), I recently posted a recipe video with 3 easy, quick, and healthy summer breakfast ideas on my YouTube channel. Check it out if you're interested! Great you made if perfectly, thanks for sharing with Hearth and Soul blog hop too. I am so making these. 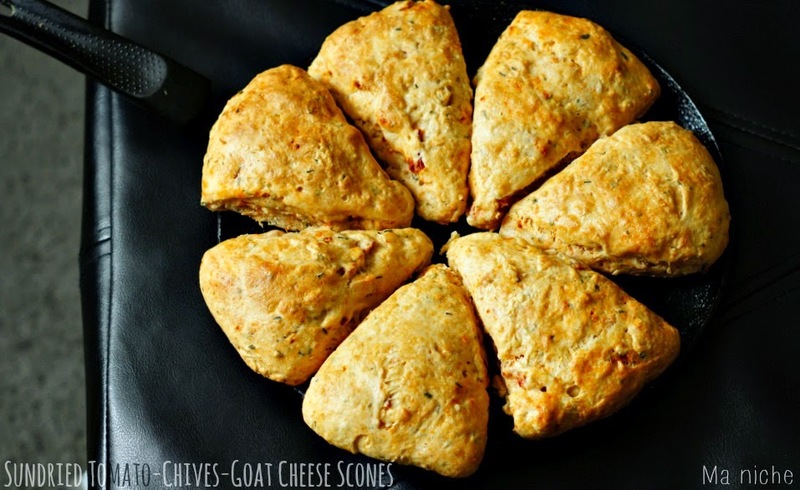 I love scones and I love goat cheese. Congratulations!! 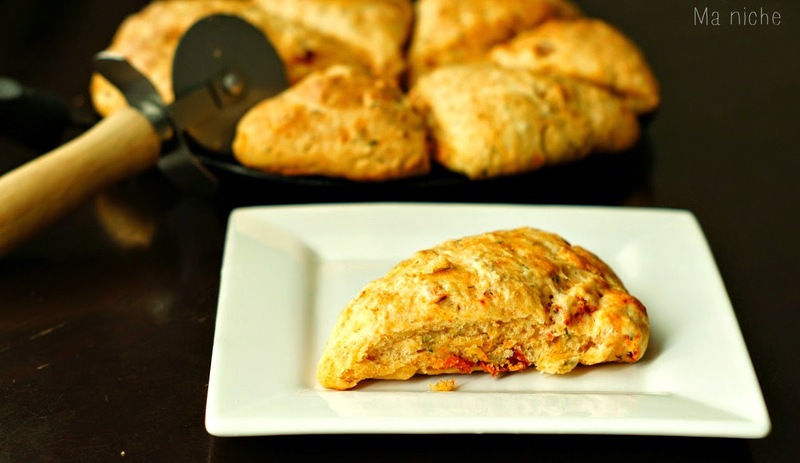 Your scone recipe has been featured at Tickle My Tastebuds on my blog, Lori’s Culinary Creations. Hop on over and grab a feature button and link up your latest culinary creations. Congrats again. I like the idea of using ground mustard in a savory scone. Yum! Oooh these look tempting. Thanks for sharing. Hello from the Clever Chicks Blog Hop!